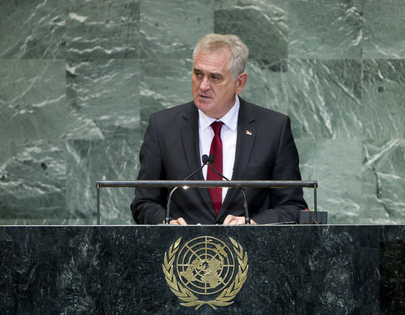 TOMISLAV NIKOLIĆ, President of Serbia, said today’s financial crisis had left the heaviest burden on the world’s most vulnerable countries. It was clear that poverty was a real source of security risks, as well as a stumbling block towards the achievement of the Millennium Development Goals. A more equitable distribution of assets, solidarity and support to underdeveloped and developing countries should be jointly agreed upon and systematically planned. Further, renewable energy sources, energy efficiency, responsible utilization of resources and socially responsible business practices could significantly contribute to reducing poverty and starvation in the world, he said, noting that his country would contribute to research, especially devoting attention to the education of young generations in ways of achieving harmony between planet conservation, development and profit. He stressed that it was a collective obligation to fight climate change in order to protect human survival and the progress of mankind. Other contributing factors to future development were health and education, he said. Investing in education was the best way of investing in future development. “Only when a PC and book in the hands of young people replace the gun will happier pages of human history be written,” he said. For its part, Serbia had contributed to security, including through sending thousands of soldiers on United Nations missions, aligning itself with relevant international documents and seeking to contribute to global and regional anti-terrorism efforts. Serbia had also stood for religious and cultural tolerance and had played an active role in regional cooperation in areas including economics and immigration. No one should suffer or be humiliated because of their religion, but no life should be lost in religiously-motivated clashes, he said, condemning attacks on innocent people and conveying his condolences to the United States over the killing of its ambassador to Libya. Turning to the European Union, he said Serbia truly wished to become a full-fledged member and was patiently building relations of confidence and peace in a region burdened with a heavy legacy of the past. Unfortunately, despite Serbia’s commitment and compliance with international law, in 2008 the self-proclaimed Republic of Kosovo unilaterally declared independence. Kosovo and Metohija was on integral parts of Serbia, he said, noting that his country had become a victim of double standards, whereby the principle of the respect of territorial integrity implied the prevention of the promotion of secession and of efforts aimed at border changes in other international recognized States. “We are more and more frequently forced by the powerful and mighty to face a touch choice: to give up Kosovo and Metohija or European Union membership. What kind of a choice is that? I hope that no one in this hall would ever be confronted with such a decision,” he said. Serbia was fully committed to participating in the process that should result in peace between Serbs and Albanians. At the same time, he emphasized that Serbia would not, under any circumstances, recognize the unilaterally declared independence of its southern province of Kosovo and Metohija. He proposed discreet negotiations at the highest political level. An agreement could be reached only through consensus without unilateral decisions and actions. He then condemned an attempt by the “so-called Republic of Kosovo” to dispossess Serbia’s southern province of its historical and spiritual heritage and to turn the property of the Serbian Orthodox Church into “so-called Kosovo” cultural heritage. He was particularly concerned that the attempt was taking place in the twenty-first century before the eyes of the international community. Turning to another sensitive area, he urged an investigation into allegations of human and organ trafficking. “We are simply asking for the truth,” he said.